I'm a lip balm junkie. I've heard that it's a vicious cycle, that once you get hooked, your lips lose the ability to stay hydrated on their own and then you are officially addicted. Well, yeah. So? The important thing is to never be stranded without some sort of balm. Which means one in your gym bag, one by your bed, one in each purse, one on your desk, one in each coat pocket... That's a lot of lip balm. I like to make sure I have a nice variety so I don't get bored. And also so I don't look like a freak at the checkout with twenty tubes of Aquaphor. Here's a sampling of my current stash. Yes, that means there's more, but you didn't really expect me to go through all those pockets did you? Aquaphor: my all-time favorite, good for so many things. Full disclosure: I have way more than three. Korres Lip Butter: in cheery coral Quince, slightly dramatic just-bitten Wild Rose, and yummy-smelling but only-to-wear-at home-because-of-the-opaque-pale-color Jasmine. H&M lip balm in Creme Brulee: not too long-lasting but delicious and ridiculously cute. Kiehl's Lip Balm SPF 15: my newest acquisition, Hue No.30G, I think I'm in love. Subtle scent, subtle hint of color, perfectly soothing. Fresh Sugar Lip Treatments: in handy mini sizes, Rose and Plum; they smell amazing but do they really moisturize? Jury's still out on these. Nars Lip Lacquer in Eros: technically not a lip balm, but this über sticky gloss lasts so long I find it's one of the most protective products I can put on my lips, and the color is perfectly mlbb (my lips but better). I keep this one in my wallet, with me at all times. Random Gift from Japan: from a friend who knows me all too well. Not the best product inside, but the little jar is too cute to ignore. Rosebud Salve: what can I say about this cult favorite that hasn't already been said? Used to be at the top of my list, but I hate the way it melts in hot summers, so now I only have a few tins left. Amazing in cooler weather though. Bonnie Bell Lip Smacker in Vanilla: the trifecta of dry lips, nostalgia and a dollar in my pocket provoked this purchase, and I don't regret it one bit. Vitamin E Stick: doesn't get much more basic than this, but it's smoother than chapstick, and, like Aquaphor and Rosebud salve you can use it on all your dry bits. This one was in my christmas stocking this year. Thanks, Santa! I love the cute little packages!!! No way, I am crazy about lip balm! I have so many and I still don't feel like it's enough! I'm crazy about lip balm too!! cute blog!!! check out mine we could follow each other, what do u think?? soy una adicta! dnd puedo conseguir en España el Rosebud Salve? rosebud salve also comes in MINT. i have both and i laaaav. but yes, they're both melty shaped now. i just picked up kiehl's lip balm spf 15 - no tint. a little gooey but i think i like it. ppl forget to protect their lips from the sun. i also have banana boat spf 30 - for when i go outside to run or something (which is never). Great picks. 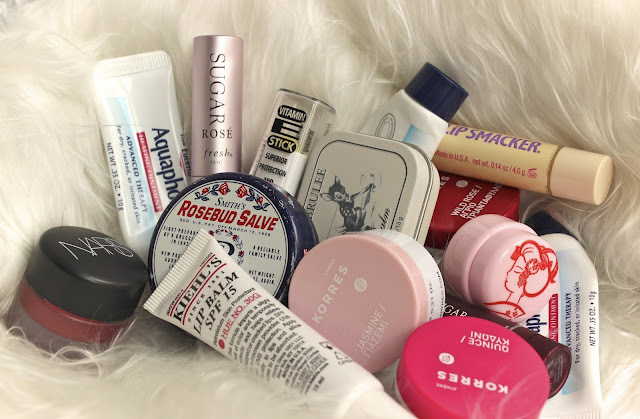 I started using my lip balms up, now because I had a similar stash. I`m absolutely addicted! 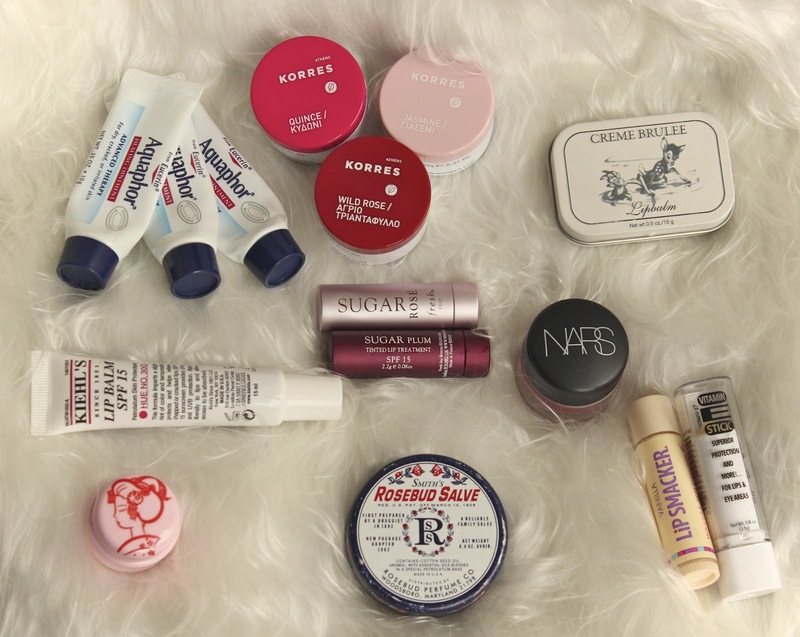 I keep a lip balm in every single jacket and bag -- they are all different. But I'm pretty faithful to Korres' Guava, which is by my bedside. My only wish it that they made in a tube form, because I'm not super comfortable sticking my finger in it all the time. I'm also a big fan of Principessa's lip balm -- it's a Canadian brand and the formula is pretty close to perfect. In the summer, I try to use Sugar since it has SPF, but I prefer the non-tinted one. I love your blog - it is really inspirational. Weirdly, I have also been using Live Clean Non Petroleum Jelly lately as lip balm and it is amazing!